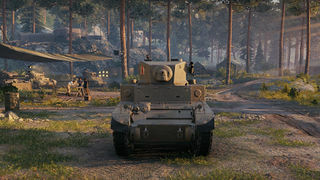 Der Stuart I-IV ist ein britischer leichter Panzer der Stufe 3. Die Serienfertigung wurde 1941 begonnen, die Fahrzeuge wurden unter dem Leih-und-Pacht-Gesetz an die Briten geliefert. Es wurden 6.889 Einheiten der Ausführungen M3 bis M5A1 nach Großbritannien verschifft. 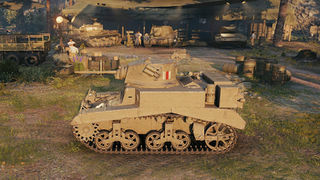 Die M3 wurden von den Briten Stuart I getauft, während die Ausführung M3A1 Stuart III genannt wurde. Der Ersteinsatz war die Schlacht um Sidi Rezegh. 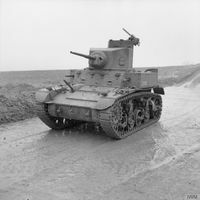 The tier III light tank of the British Lend-Lease line, the Stuart I-IV will give you the same things you felt from the British M2; something much more sluggish than the American version. The main difference is the 2-pdr cannon you receive, making this LT much more suited for trading shots and supporting the main force, rather than charging head on like the M3 Stuart. Der Stuart I-IV führt zum Grant. Is able to mount the excellent British 2-Pdr. gun, which performs exceedingly well at lower tiers. High RoF on all guns. Has adequate armor for its tier; the frontal armor will bounce most lower tier auto-cannons and machine-guns. Good mobility and top speed when fully accelerated. In comparison to its American counterpart, it is slower, less mobile, has a lower RoF and a poorer radio. Has a boxy silhouette, making it an easy target to hit. Still has the same armor as the M3 Stuart, meaning that if you're caught off guard and get flanked, your sides and rear will get ripped to pieces. 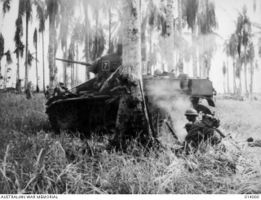 The Stuart I-IV it plays quite differently to its American counterpart, the M3 Stuart. It gains the OQF 2-pounder, which is better than the M3's 37mm M6. But where it gains in firepower, it loses in speed and radio range. 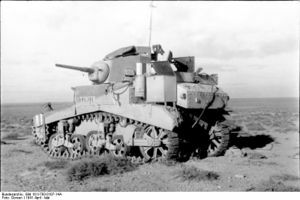 It will take more time to get to its top speed compared to the M3 Stuart, and will not be able to contact allies of enemy positions from across large maps. Not only that, it still has the same armor as the original M3 Stuart, and is sluggish due to the weaker engine. Stick to your friends and support by flanking enemies. Use the 2-pounder's excellent penetration and rate of fire to rip your enemy's side apart. 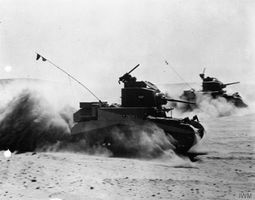 Radios will be available if you've played British tanks already. Mount it immediately. Research suspension and engine to gain much needed speed and maneuverability. Research turret. 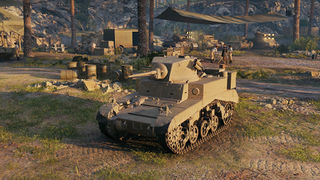 The 2-pounder is already available if you've played any of the British low tier 'Cruiser' tanks, so mount it too. Diese Seite wurde zuletzt am 27. März 2017 um 11:08 Uhr geändert.